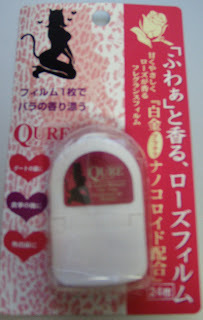 A Rinkya Blog: Qure Your Bad Breath! These rose flavored breath strips are said to be "A Good Breathe For You"
Although promising to be romantic, our staff thought the breath strips tasted like an R rated word that rhymes with grass. However they are certainly weight conscious, only 4 calories for the entire package of 24 strips.